One of the great centres of Celtic Christianity. where the Book of Kells may have been written and illustrated, this busy little crossroads today offers numerous reminders of its glorious past. Kells is also known as Ceanannus Mor. In AD 563, St Colmcille, also known as St Columba, founded a monastery on the Hebridean island of Iona. When the Vikings raided it in 802, some of its monks sought refuge at Kells, where they founded a new Columban monastery in 804. It probably survived until around 1200. The circular shape of this monastery is followed today in the street pattern of the modern town. The monks continued to be hounded by Vikings, who plundered the settlement four times, and nothing is left of the several churches the monks built. However, a house and Round Tower can still be seen. The Round Tower, 90ft high, was built before 1076, and stands in the churchyard. It has a door that was once 15ft above the ground, reached by a ladder which the monks could have drawn up after them when threatened by Viking raids. Once the tower would have contained about five floors, connected by an internal staircase. Now these floors are gone and the tower is as empty as a chimney. The house, now called St Colmcille’s House, was perhaps a monastic library. Today, its vaulted interior has only an attic storey of three tiny rooms beneath the steeply pitched stone roof, where vellum -the calfskin that the monks used to write on-may have been stored. Perhaps it was in this house that the monks completed the writing and decoration of the Book of Kells. This richly illuminated copy of the Gospels is now kept in Trinity College, Dublin, although impeccable reproductions can be seen in Kells town hall and in the Protestant church. Three ornately carved stone crosses from the 9th century stand in the churchyard, and a fourth at the crossroads below it. These High Crosses are similar to many others elsewhere in Ireland, some of which probably marked sites for open air religious devotions. One of these Kells crosses, at the foot of the Round Tower, is more than 9ft tall and, unusually, has a Latin inscription. The 8ft high cross in Market Square, the busy centre of Kells, probably marked the edge of St Colmcille’s monastery. It is decorated with 30 panels of carved illustrations, including Adam and Eve, the Sacrifice of Issac, Daniel in the Lions’ Den, the Crucifixion, and the Resurrection. The cross was badly damaged in the religious wars, but was repaired and put up again in 1688. Its base is interestingly grooved where, it is said, English soldiers sharpened their swords. 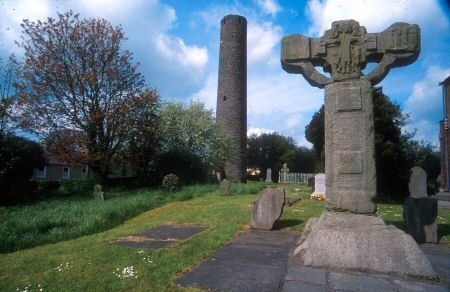 Kells is steeped in history and is a must see attraction on your tours of Ireland.